That’s why people call him a poker champion! Jason Mercier of South Florida has done great in the latest poker series of World Series of poker 2016. The player just won another gold bracelet here in this particular series for $10K buy in HORSE. The player took home an amount of $422,874 and this was the event#24 of the series, out of total 69 gold bracelets to be played. The player loves to play poker and had done simply great till date by winning five gold bracelet from different world series of poker tournaments. The 29 year old guy is a pro poker player and has total 50 WSOP cashes with him, whereas total final table appearance for the player is 18, out of which he has won 5 gold bracelets. He has five WSOP title, 2 WCOOP titles and 1 EPT title in his account, and lifetime earnings for the player now increased to a whopping $4,456,952. Jason was indeed very happy and said that “it feels amazing, I am really happy that I’ve done this for fifth time”, I was not playing well in previous games and bricked like in 30 games but it is over now and it really feels great now. The tournament attracted 171 players and generated a cash prize pool of amount $1,607,400, but it was Mercier who took home the title of the championship along with the first prize. 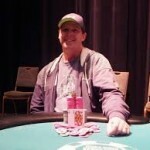 James Obst, a pro poker player from Adelaide, Australia was the runner up of the event and collected $261,354. He was looking good at time but not good enough than Mercier. A New Yorker, Nick Schulman was the third position holder of the game with total winning share of amount $183,779. He has been through many WSOP final tables and this time also he managed to do this but could cross the like. Fourth,fifth and sixth places were for Adam Friedman ($131,519), Mikhail Semin of Moskow, Russia, who ended up with $95,817 and Jesse Martin for $71,089. Meanwhile seventh and eighth places of the match belong to Yuval Bronshtein and Bryn Kenney, who collected winning share of amount $53,729 and $41,383.